Following my analysis of the situation in Romandie I tried the same for Suffolk, UK. NOTE : Since this is also post-IPCC 48th session publication (http://ipcc.ch/) – the stunning summary for policymakers by global scientists (see refs below) on global warming, I’ve highlighted some of their key recommendations here. Firstly, the UK data sets are much harder to access than Europe and unless you look really hard the Met Office will charge you (quoted me £275) to get the data. I understand the need ‘secure’ data and prevent misuse but still the conspiracy theorists love this apparent cloak and dagger stuff. 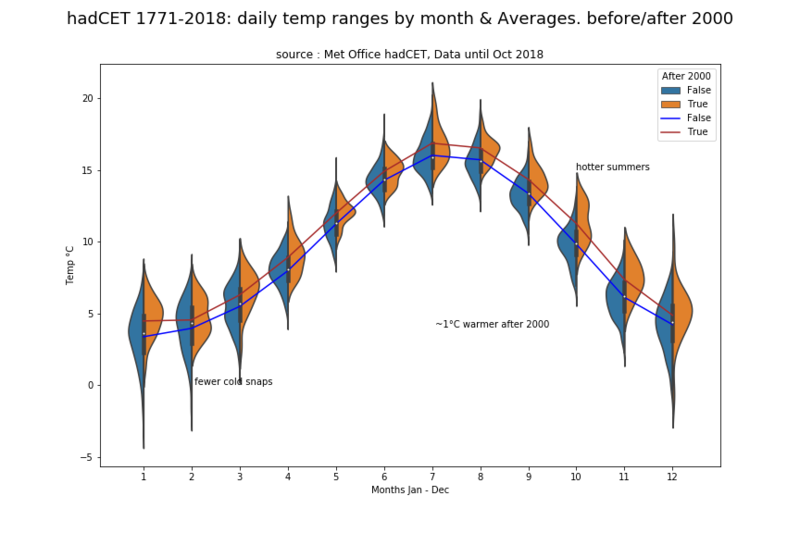 The hadCET is the oldest continuous temperature dataset (worldwide) based on daily records from Hadley Central England average (min/max) temperatures since 1773! 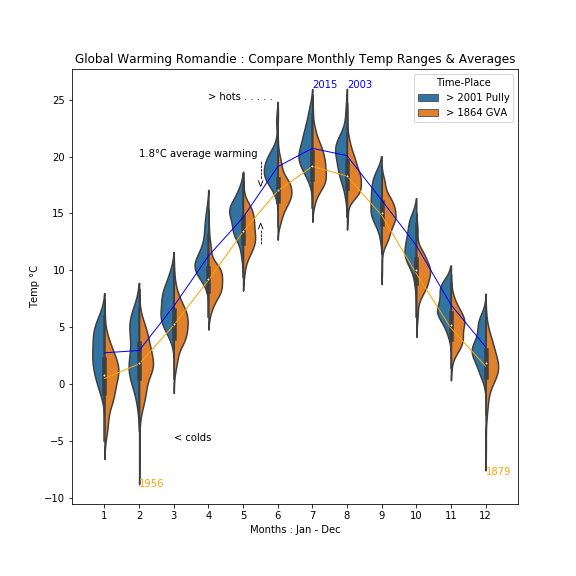 Below is the hadCET data showing a trend in 20th century for warming with fewer cold snaps and more warm spells. I also overlaid the Wattisham data set from 1971, which was was cobbled together from Met office and Tu Tiempo sources. — changes in the moving average begin to show in min 1900s shortly after the Wattisham dataset begins. IPCC states just under 1°C warming during last decade over pre-1900s period. Secondly the impact of warming is not as strong in UK as for Romandie, I guess it’s to do with the maritime climate which is possibly why springtime seems ‘insulated’ from the warming compared with summer. This is reinforced by IPCC findings see A1.2 in their report. 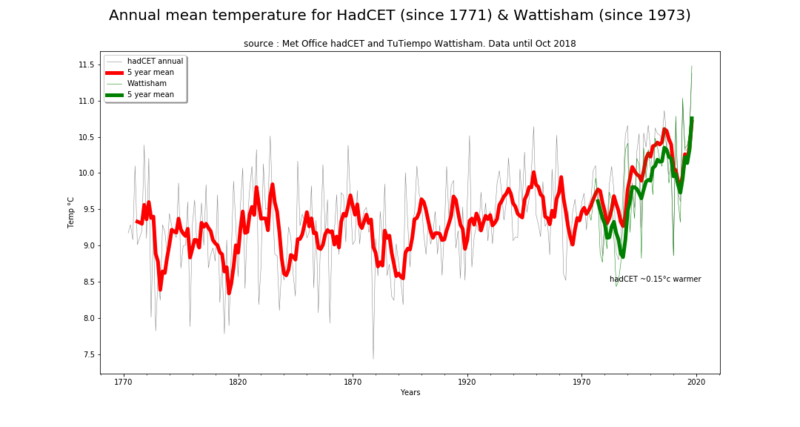 Wattisham daily temperature records are available since 1973 and apart from a gap in 1977 they are good and strongly correlated (0.993) to hadCET (0.15°c cooler), so I just used hadCET for this anaylsis and applied to Suffolk. continues rise in sea levels until 2100 no matter what we do now, if we can keep global warming at 1.5°c sea level rise will be reduced by 0.1m impacting around 10 million people directly. As the scientists again try to impress urgency and importance around climate change my update shows the ongoing impact in the Romandie region : an average increase near 2°C during the last 150 years and more extreme events. Using official meteo data from Geneva (GVA) (1) since 1864 and comparing with millennial data from Pully we can observe an average temperature increase of around 1.8°C with some months like January already exceeding 2°C. 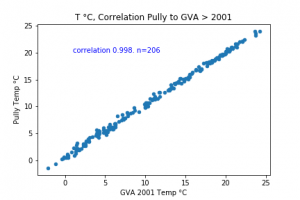 Equally worrisome is the increase of extremes, shown in the blue spikes. 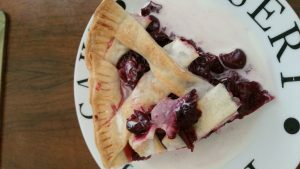 The Raspberry Pi bird scarer did wonders this year, combined with scary ballon eyes, fake snake and a new false hawk we managed a yield of about 10kg of cherries – a record. Sirilr poves to be a great, flexible imaging programme for DSLR photo – just have to be careful with Flats and use the super pixel debayering to keep file sizes down 100mb vs 25! 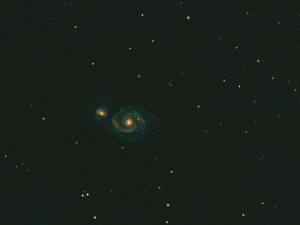 Here is M51 whirlpool galaxy 14 images of 240 seconds takem remotely using Raspberry PI with INDI/EKOS processed and stacked in Siril using superpixel mode then cropped. it seem all the fuss with rpcbind and nfs not reloading at boot is solved in Jessie, at least I found that when I remove the FSID=0 from the server exports file definition it seems to work well. Tried with Autofs to mount the server NFS but go constant dropped folders and NFS server timed out – tried all options on mount, timeo, sync etc to no avail. The only thing that worked was a new SD card with Stretch full but mounting the NFS in fstab, although it appears stable (no more time outs) the systemctl status nfs shows .mount changed on disk run daemon relaod. This looks like a bug. Using a solar filter in a 60mm F/12 scope mounted on GPx and using a 60Da via Raspberrypi and BYEOS to make a planetary AVI + jpg. 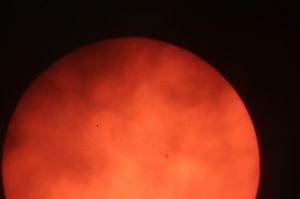 Here one shot through the clouds – can you see Mercury?